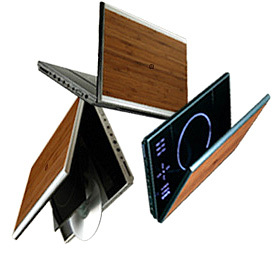 Amadana Stylish Portable DVD Player | OhGizmo! A few years ago pulling out your portable DVD player would have definitely caused a few heads to turn and some jealous stares. But these days the players are relatively cheap so everyone seems to have one. But if you’re the type who always needs to stand out and have the best toys then this portable DVD player from Amadana will fit the bill. The first thing you notice about the player is the laminated bamboo finish on the lid. While it kind of borders on 80’s wood-finish electronics I think it does lend a sort of high-end aesthetic to the device. Other features include a backlit flat-touch panel for the play controls, a 10-inch wide TFT LCD screen, built-in Dolby digital sound and an SD card slot for viewing images, music or MPEG movies. The Amadana portable DVD player is available now for a ridiculous $1200. I?ve visited your website and thinking that we have great potential of cooperation. We are one of the biggest electronic consumables manufacturers in South China, specialized in Switching Power supply, Adaptor, Electronic Transformer, Converter, inverter, car charger. We are confident that our products are competitive enough to earn your trust and we are longing to be your reliable partner. If there is anything I can be of help, let me know! I?d be glad if you could add me into your msn or skype and talk business with me on line.